Search for the best flight prices from Stansted to Belfast. Compare prices, book today and save money with Stansted Airport. Belfast is a hotbed of diverse pleasures and a living history that’ll enthral your imagination. 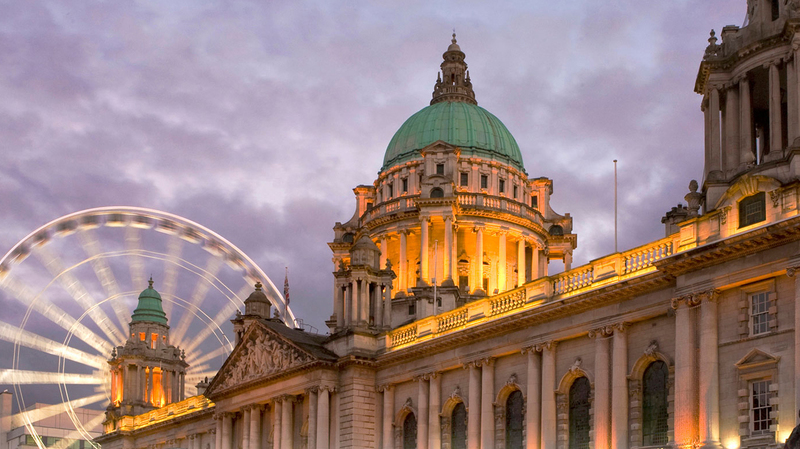 With the same industrious dedication that produced the Titanic, Belfast never fails to create something new; from the latest in stylish night clubs and a delectable selection of trendy restaurants, to the huge variety of boutique and ordinary hotels. Belfast locals are known for their rich character and the warm welcome given to visitors, and the city features a myriad of quirky independent stores, situated comfortably alongside the latest styles and trends. The variety found in Belfast’s hotels reflects the culturally diverse nature of the city, which ranges from a backdrop of shipbuilding heritage to its thriving nightlife. A former bank plays home to the five-star Merchant Hotel (16 Skipper Street), which offers a spa and champagne bar, while the more affordable Park Inn by Radisson Belfast (4 Clarence Street West) boasts an excellent city centre location. The Ten Square Hotel (10 Donegall Square South) is a trendy boutique hotel with 23 rooms, or for those wishing to be close to the Odyssey Arena, the Premier Inn Belfast Titanic Quarter (2A Queens Road) should suit. Belfast offers a wide array of shopping options from quirky independent shops to high-street chains, meaning there should be something for everyone. The Victoria Square Shopping Centre (1 Victoria Square) is packed with household names such as Apple, Ted Baker, and more recently Hugo Boss. For something a little more unique head to the Corium (37 Church Lane), for a selection ranging from painted plaques to handmade jewellery, or for homeware produced by local designers seek out Space Craft (9b The Fountain Centre). For an excellent selection of quality antiques over two floors check out Oakland Antiques (135-137 Donegall Pass). Local ingredients are abundant thanks to Northern Ireland’s plentiful farmland and coastline, with a particular tipping of the hat going in the direction of the seafood. Fresh produce can be found on Fridays, Saturdays and Sundays at St George’s Market (12-20 East Bridge Street), while the Arcadia Delicatessen (378 Lisburn Road) is worth a visit. For an evening meal some of the most highly recommended spots include Deane’s (36-40 Howard Street), The Barking Dog (33-35 Malone Road) and Mourne Seafood Bar (34-36 Bank Street). This arts festival encourages creativity in children and young people from the ages of three to 25, through a range of performances, readings and workshops are put on across Belfast. The infamous Titanic was built in the docks of Belfast, and the city celebrates its maritime heritage each year in May. Explore this seafaring history further while enjoying the variety of Titanic-themed events, which compliment an array of impressive ships on display. Artists, acrobats, clowns and stuntmen convene in Belfast for two weeks every year to put on a selection of superb street performances. With those showcasing their talents being paid a fixed amount, proceeds go towards the staging of the following year’s Festival of Fools. The Cathedral Quarter plays host to this yearly arts festival that’s ranked as one of Belfast’s top events. A diverse array of both established and up-and-coming musicians, visual artists, comedians and authors put on performances to entertain the crowds. Féile an Phobail was created to celebrate the creativity of the local community in the face of social problems. The annual festival is particularly geared towards community art and traditional music, and has been going for a quarter of a century.